Celebrating Thanksgiving with divorced parents. 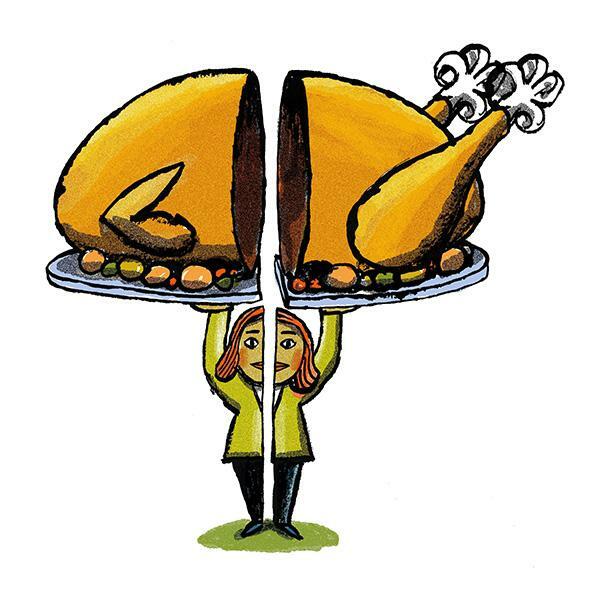 Thanksgiving is a time of coming together, but how does that apply to families of divorce? In the last nine years, I’ve shared only one Thanksgiving meal with both of my parents, who divorced during my senior year of high school. It was in 2010, and the impetus for the reunion was completely unplanned and less than joyous: My maternal grandfather died unexpectedly early that holiday morning, just as all of my extended family members were preparing to gather at my aunt’s home. Hours later, after business was taken care of at the hospital, we all met for dinner as planned. The mood was, of course, somber, but also comforting, as we reflected on our memories of Granddad and tried to be grateful for all we had. To the complete surprise of my younger sister and me, my mom asked my dad to join us that day. My parents’ separation was less than amicable, and prior to that day they had barely been able to speak to each other on the phone, much less spend an hour or two in each other’s presence. (My college graduation had consisted of two separate family celebrations.) But prior to the divorce, my dad had been very close to my mom’s parents, and while he hadn’t spoken to either of them in years, in an odd way it made sense for him to be there that day. When he arrived at my aunt’s, it was almost as if no time had passed—hugs went around, tears were shed, and my mom and dad comforted each other in a way that I hadn’t seen since I was a kid. It turned out to be a big breakthrough for my parents—since then they have been on good terms, and my recent graduation from graduate school included a single celebratory lunch with both of them. Still, other than that memorable holiday in 2010, I’ve celebrated all of my adult Thanksgivings (and Christmases) with my parents separately—my mom has left the door open for my dad to join her side of the family in the festivities, but he politely declines. Their relationship is better than it was before my grandfather’s death, but they’ve also moved on. Splitting holidays has become routine and more or less uncomplicated for my sister and me, especially since my parents still reside in the same town. I asked other children of divorce about their post-separation Thanksgivings, and most of them reported having experiences similar to mine. Most can’t recall ever spending the holidays with both their parents post-split; one colleague lamented having to choose among three families (one of which is his girlfriend’s), who all live very far away from one another. And for some, the thought of sharing a Thanksgiving meal with both parents at the same time would never even cross their mind: “That would be very weird,” in the assessment of one friend. I did find a couple of exceptions, and thankfully the reasons behind them are not as tragic as mine. Another colleague, whose parents divorced when he was an infant, did separate dinners until he went away to college; then they began combining their Thanksgivings “out of logistic efficiency.” His parents, he explains, have always gotten along fine, and “it makes sense for us to all spend time together at this point simply because my free time is limited … and both [of them] want to see me.” The only real tension has come from his parents’ differing opinions on how to celebrate—his father would much rather dine out for Thanksgiving, while his mother relishes the creation of a lavish meal. This Thanksgiving, like last year’s, he’s happily hosting them and his friends at his own apartment, with a huge homemade dinner that will allow his father to avoid the rigors of cooking. While they aren’t repeating the occasion this year, she thinks it’s likely that it will happen again in the future. And the significance of it all isn’t lost on her: “This coming together is actually pretty symbolic around Thanksgiving.” On a holiday devoted to gratitude, it makes sense to let go of grudges, set aside differences, and focus on the positive. I’m doubtful my parents will ever spend another Thanksgiving together, but I can relate to this interpretation of the experience. Thanksgiving Day really did help my family assuage much of the hurt that always comes with divorce. And it makes me wonder if more divorced parents would benefit from spending at least one Thanksgiving together. When exes bring good intentions to the table, it’s the perfect occasion to open the door to a healthier relationship. It gives parents, and their kids, more to be thankful for all year round.